This tutorial is for an old version of Puppet Master, some links are broken and may not work expected. A new version is available here: How to Install Puppet 4.x On CentOS 7 / RHEL 7. Puppet is a free and open-source configuration management tool, helps you to centrally deploy and manage the configurations of hundreds of client systems. It is available for GNU/Linux, Mac, BSD, Solaris and Windows-based computer Systems, released under Apache License, written in “Ruby” language. This guide helps you to install puppet on CentOS 7 / RHEL 7. In this architecture, One or more servers run the puppet master application, usually as a Rack application managed by a web server (like Apache with Passenger) and puppet agent application runs on client servers, usually as a background service. Periodically, puppet agent will send facts to the puppet master and request a catalog. The master will compile and return that node’s catalog, using several sources of information it has access to. In this architecture, client servers run the puppet apply application( self-contained combination of the puppet master and puppet agent applications), usually as a scheduled task or cron job. Here, i will show you how to configure a puppet in master / agent architecture. 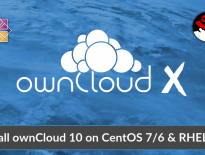 In this tutorial, i will be using two CentOS 7 systems as mentioned below. 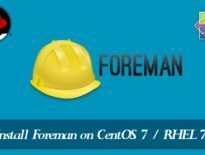 Configure EPEL repository on CentOS 7 / RHEL 7. Make sure your system (both puppet server and client) is able to resolve the hostname each other, either use /etc/hosts file or DNS server. Note: Only on the master server. To install the puppet master / agent, we would require to setup puppet repository on the all the nodes. Enable puppet labs repository by installing below rpm. Note: Run it on both master and agent nodes. Now, its time to install puppet. Install the puppet server using below command. As said earlier, we will configure puppet for master / agent architecture. So, this node will acts as a master node. Edit the puppet configuration file and modify the dns_alt_names. If this machine is the only puppet master in your environment, run below command to create the puppet master certificate. Once you get “Notice: Starting Puppet master version <VERSION>“, press ctrl-C to kill the process. Puppet comes with a basic puppet master web server, but this cannot be used for real-life loads. We must configure a production quality web server before we start managing our nodes with Puppet. Install Passenger and apache module. Create three directories for the application (a parent directory, a “public” directory, and a “tmp” directory), Copy the ext/rack/config.ru file from the Puppet source code into the parent directory and Set the ownership of the config.ru file. Add virtual host for puppet by creating the below configuration file. Add below content into the virtual host file, change the green colored entries as per your environement. Restart apache server to take an effect of puppet virtual host, to do that, run following command on terminal. Disable puppet service and enable apache server to auto start on system boot. Puppet listens on port no 8140; Configure the IP tables to allow it. On your client machine, install puppet agent using below command. Note: You must have puppet repository configured on the agent nodes. Edit the puppet configuration file and set puppet master information on the client stanza. Start puppet on agent node and make it to start automatically on system boot. You would get below events in the logs. Oct 21 05:46:46 client systemd: Started Puppet agent. Oct 21 05:47:03 client systemd: Reloading. Log into the puppet master server and run below command to view outstanding requests. Run puppet cert sign to sign a request, or puppet cert sign –all to sign all pending requests. That’s All. Now, you have successfully configured puppet master and an agent. It’s time to create a manifests (client configuration). Stay tuned.